It’s been a while since I saw Homi Adajania’s debut film Being Cyrus, but in the flashes of it that come to mind I think of overstuffed, almost claustrophobic apartments of its eccentric Parsi characters with all assortment of unusual items sitting on the nightstands and around the house. In Finding Fanny, the director’s team has shifted from Bombay to Goa, and again managed to design the sets (the homes, the car) with a casual clutter that makes them believably lived-in (the postmaster’s fridge has old postage stamps stuck to it, rosaries hang from a rearview mirror), but when it comes to the quintet of main characters, for me, it all felt quite empty. Dotted around this wonderful mise-en-scene of whitewashed churches, foreign hippies and waving palms, you have the choir boy postmaster, Ferdie (Naseeruddin Shah), pining for almost 50 years over an unrequited love he was too timid to approach in person, then there’s Rosie, the Mother Superior of the town, who’s a mix of curvy vixen, flowers always somewhere askew in the back of her hair and fan constantly being fluffed and unfolded and flapped, when she’s not doing her best impression of a Goan church lady, except instead of frowning and pursing her lips, Dona Rosalinda, is quite free about launching into her imperious verbal and physical attacks on anyone who crosses her path. Add to this mix the greybeard Don Pedro (Pankaj Kapur, as the ponytailed, lecherous painter with a fondness for zaftig women of a certain age). The two ‘engsters’ who complete the ensemble are Savio da Gama (Arjun Kapoor), an ill-tempered, sleepy-eyed boy back from Bombay, who’s always had a thing for Angie (Deepika Padukone), long, lean, benevolent and the living embodiment of term “susegad” and who was briefly married to his best friend, Gabo. It sounds like a fun premise, right? You’ve got the gifted, known quantities of Naseer, Dimple and Pankaj, plus the two twenty-something beauties to appeal to the younger moviegoers, but for me, the majority of the characters were generally hollow. Don Pedro started off promisingly enough, sitting open-shirted as we get to follow a rivulet of sweat weaving its way down his bare chest, through his own considerable cleavage and south toward his belly, but after only a short time on the road, the libidinous, spoiled artiste shtick began to wear thin quickly. Where was the depth we saw Kapur portray in Maqbool? Naseer too was a disappointment as Ferdie, presented to us as a wimpering child-man through most of the film, and then at the climax, his puzzling reaction, quite ho-hum when you would have expected a show of emotion, just further obscured the portrayal. In Zindagi Na Milegi Dobara, in a much smaller role, Naseer was far more real and convincing as the painter who just wasn’t into the whole Dad thing, or as Lalit Verma, the overwhelmed father of the bride in Monsoon Wedding. The final male lead in this group of five, Arjun Kapoor, also seemed quite shallow. When he wasn’t blustering and throwing tantrums (which was most of the time), in the few intimate scenes with Deepika Padukone, it was hard to tell if any of Angie’s words were actually reaching him and sinking in, or if he was semi-comatose. Alas, Dimple Kapadia doesn’t fare much better – for most of the time, she’s a shrieking harpy, heaving her ample bosom and bum around as she pushes people out of her way, and when the moment comes for The Big Reveal of what her secret pain is, my reaction was “Meh” – not because I’m a cold, heartless woman, but because I didn’t feel for a moment that Dimple or Rosie even were experiencing anything that profound either. This was a shame, as Dimple has shown in Luck By Chance, and in Being Cyrus, that she can play The Older Woman Who Is a Force to Be Reckoned With exceedingly well. The one bright presence in all of these let-downs is Angie’s character and Deepika Padukone’s performance. Her Angie is believable as the easy-going girl who loves her town and the odd people living there, and who manages to glide over whatever bumps are thrown into her path along the way. As I looked up at Deepika on the screen, I thought “She’s at the most perfect age and moment right now.” She’s no longer the young, innocent, ingénue, all wide-eyed and malleable (like in Om Shanti Om). She’s now a strong young woman who’s got some life experience under her belt, and it feels as though it seeps through her pores and into her performance as Angie. I loved that it was Angie who made the moves on the dithering, pouting Savio, rather than standing by and waiting for him to catch on or get a clue. I loved Adajania’s portrayal of Angie as this gorgeous girl who is confident enough to walk around her small town in bra-bearing see-through blouses and short skirts, yet Anil Mehta’s camerawork never once lingered on Deepika to drool or gave her any kind of lascivious onceover. Her make-up was minimal (though not in the kind of obvious “I’m doing a deglamorized role” way) and her delivery and performance felt genuine. To me, Angie and Deepika were the saving grace in Finding Fanny. Ah, but then there was the comedy. I just didn’t get it. 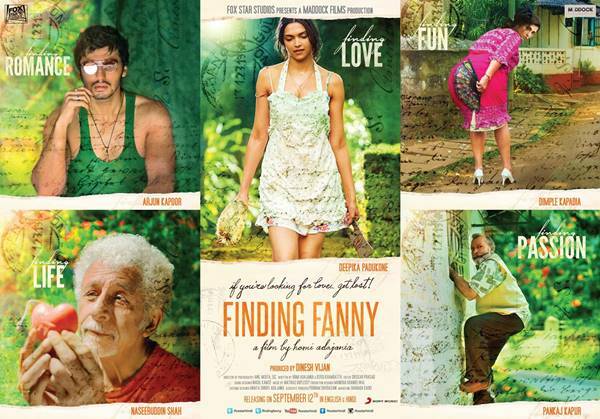 And I’ve never thought my sense of humor as being particularly refined or overly fond of subtlety (for example, this cracks me up to no end), but for me, the jokes and the humor in Finding Fanny were either repetitious, over-the-top or unfunny (and sometimes all three). How many times do we need to see Don Pedro rubbing his hands together (literally or metaphorically) as he ogles Rosie. How many shots of Rosie’s generous cleavage and derriere do we need until we get the point? And poor Ferdie, how many silly things does he have to do to tell us, what? He’s a simpleton? A child in a middle-aged man’s body? An idiot? The sum total of it was frustrating and often made me impatient. Homi Adajania’s Being Cyrus was all about bad thoughts and deadly deeds among a group of quirky Parsis, Finding Fanny is the overextended daytrip of a bunch of lovesick quirky Goans, though with a brighter filter overall. I told a friend yesterday that I didn’t think it was worth going to the cinema and spending the money to see Finding Fanny, but as I think about it some more, the cost of admission might just be worth it for Deepika’s performance and the lovely scenery along the way.